Join us for these Special Ticketed Events! Release the artist within and unwind with an evening at The Fort. 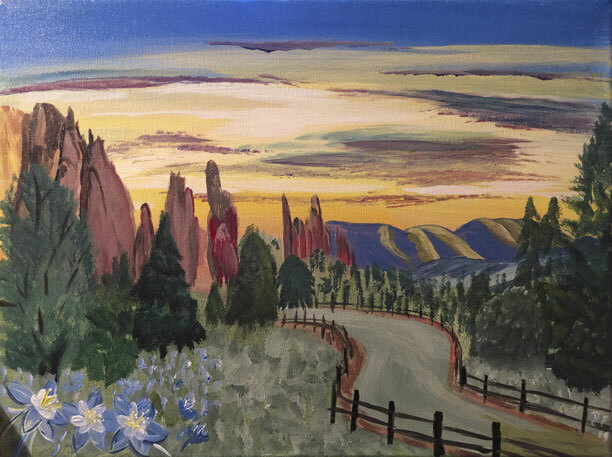 Create a Red Rocks inspired canvas painting, lead by local artist Dani, giving step by step instructions. Create a display-worthy piece on a 11″x16″ canvas during a fun two-hour paint session. 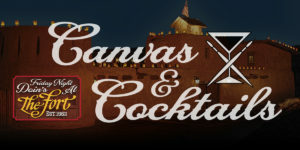 Enjoy appetizers, desserts and wine while painting your masterpiece! The Fort would like to welcome food critic, Bill St. John, of the Denver Post and the Chicago Tribune as a featured guest of our Cooking Demonstration. Bill St. John has written and taught about restaurants, food, cooking and wine for more than 40 years. Bill will be working side by side with The Fort’s Executive Chef Ian Stewart-Shelafo. This fantastic duo will be demonstrating the Native American delicacy of Bone Marrow. 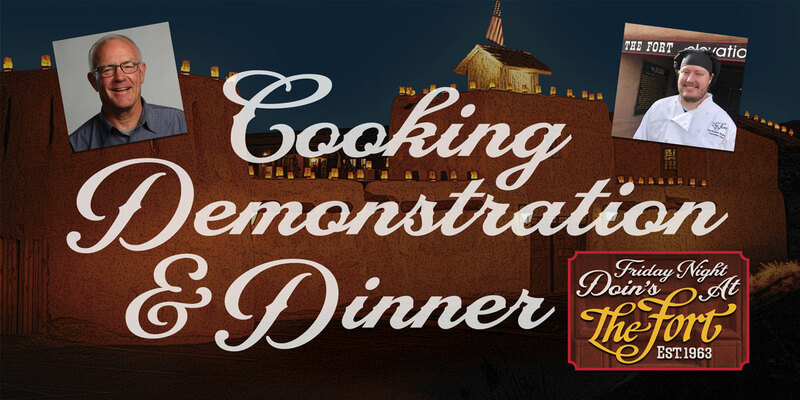 The cooking demonstration will also include how to make The Fort’s famous green chile sauce. Attendees will get to enjoy a four course prix fixe menu, the cooking demonstration by Bill St. John and Chef Ian Stewart-Shelafo and a history of Colorado foods. Don’t wait to try our historic demonstration leading you back to the Santa Fe Trail! Kentucky Derby Pre-Derby Party presents Southern charm and hospitality at its finest. Enjoy the most unique party setting on our helicopter pad, offering the best views and the swankiest live music! Don your most festive derby attire and join us for mint juleps and moscow mules! We can’t forget the Pimento cheese and a pig roast. Dust off those big hats and summer dresses, bowties and blazers, as the night will finish with a contest for best dressed and best hat. 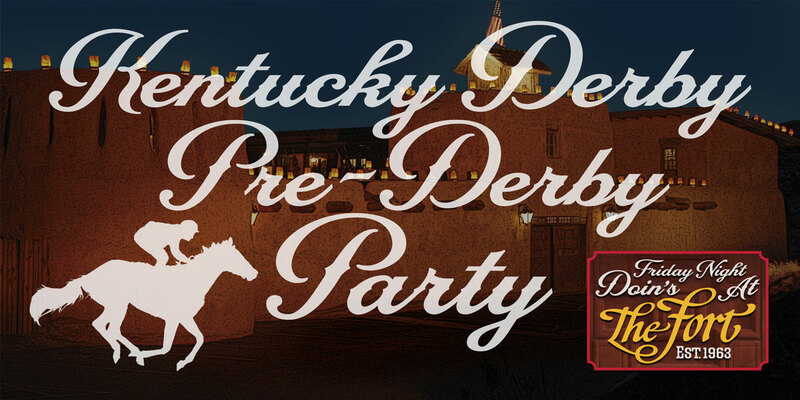 Make The Fort your new Kentucky Derby Tradition! 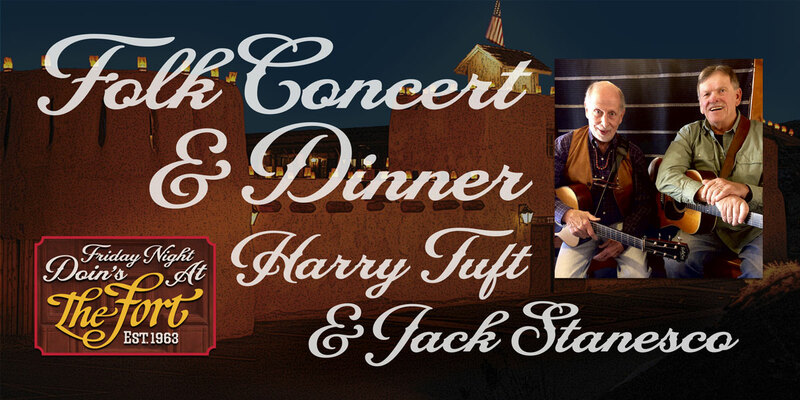 Enjoy a four course dinner featuring New Foods of the Old West, while enjoying a private folk concert featuring Colorado legend Harry Tuft and Jack Stanesco from Grubstake. Harry Tuft is a noted figure in folk music, especially in Colorado. He is the founder and former owner of the Denver Folklore Center which he started in 1962. Tuft was inducted into the Colorado Music Hall of Fame in 2012 and was recognized for his extraordinary contributions to Denver’s music scene. Tuft maintained his solo career while also performing together with Steve Abbott and Jack Stanesco, creating the band Grubstake. The amazing trio opened for The Nitty Gritty Dirt Band and WIllie Nelson at Red Rocks Amphitheatre. He has remained prominent in the Colorado music scene and continues performing after his retirement from the Denver Folklore Center in 2016. Of all of our senses, sight dominates how we perceive the world around us. Most of us live our daily lives not thinking how powerful our vision is, or how much we actually use our vision day to day. Have you ever wondered a world without sight? How would our other senses react to complete darkness? DOINS at The Fort wants to take you on a unique journey, exploring and heightening your taste buds. Not only will food begin to taste better but conversations and interactions with your loved ones will become a brand new experience. Dining in the Dark is led by our friendly and attentive wait staff that will walk you through your entire evening. You will “feel” and “taste” your way through a four-course prix-fixe meal. 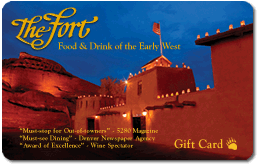 The Fort will offer two tasty options for our guests but keeping the menu a secret to test your tastebuds! A cash bar will be available for alcoholic beverages including house specials, beer and wine- ask your server. 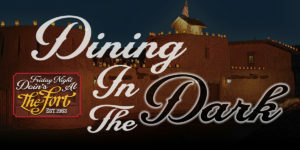 Dine in the Dark at The Fort- for memories and laughter to last a lifetime! Book today as we expect to sell out! Your wedding day should be filled with joy, laughter and wedding bells, but not for this not so happy couple. A member of their wedding party has been murdered! Can finding the murderer of their dear friend bring them closer to saying I DO? Help trade clues with the guests to find out whodunit before the bride turns to bridezilla. Time to turn this nightmare into the nuptial wedding of their dreams! The bride and groom aren’t picky, so you can wear whatever you’d like. In fact, we encourage you to wear the most ridiculous wedding attire you can come up with. It will make their special day that much more special as long as they get the chance to walk down the aisle! 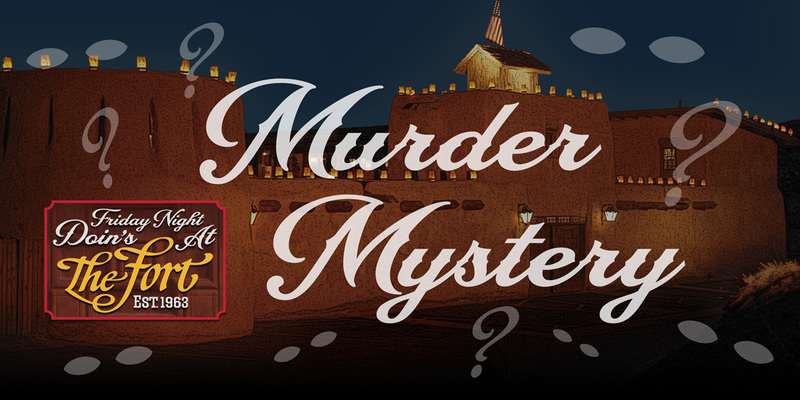 DOINS at The Fort invites you for a night of wedding bells, mystery and murder. A three course prix-fixe meal will be offered for an experience like never before! Buy your tickets today. Tickets include; salad, entree, dessert and 1 house alcoholic beverage as well as participation in the murder mystery production. Ticket price is all inclusive (tax and service charge) $79 per person. Served with unlimited coffee, hot tea and iced tea. Event is rated PG – 13. Sometimes a great thing gets even greater when its combined with something else. Like peanut butter and jelly. Or macaroni and cheese. Or dinner and a movie! 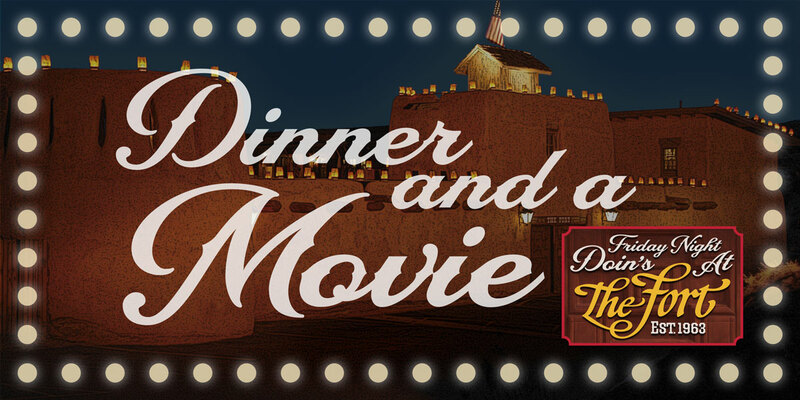 If you think you had ‘Shinin Times’ at The Fort before, come join us for a four course prix fixe meal combined with a viewing of “Across the Wide Missouri”. Director William Willman brings us back to the wild west, set in 1830. Clark Gable stars as a fur trapper, spending his summer days at the “rendezvous’ to trade goods. Follow this love story as the mountain men, fur trappers and Native Americans try to establish terrority and peace.